12 years before, I’d been invited to create a land art work in the vicinity of Eagle Bay, Cape Naturaliste, not so far from Margaret River. The research I undertook then was invaluable for this new commission at The Farm, this included an initial engagement with the Wardandi community at the Wardan Centre. The very first morning I woke up in the cottage overlooking The Farm, I was dismayed to see a sink hole completely defiled by cattle. This sink hole is the single source of spring water on the farm, the water from which ultimately ends up in the Ellen Brook River – a river that is so polluted it should not be swum in. My dismay triggered an immediate vision, the like of which I’ve never experienced before: a woman over half a kilometre long lay in the shallow valley of the farm, the spoiled sink hole being her life giving area. Following discussions with my friend and fellow art in nature artist, Elaine Clocherty, currently living on The Farm and, soon after, with the clients, we contacted the local Wardandi elder, Vivienne Brockman, a close friend of Elaine’s. Vivienne soon visited The Farm and confirmed that in Wardandi accounts this place has always been important to women. Vivienne informed us of traditional aspects of the land and its agriculture. Eventually, following her guidance, I created a sculpture in the form of a goorbal or navel for the female form in the land. 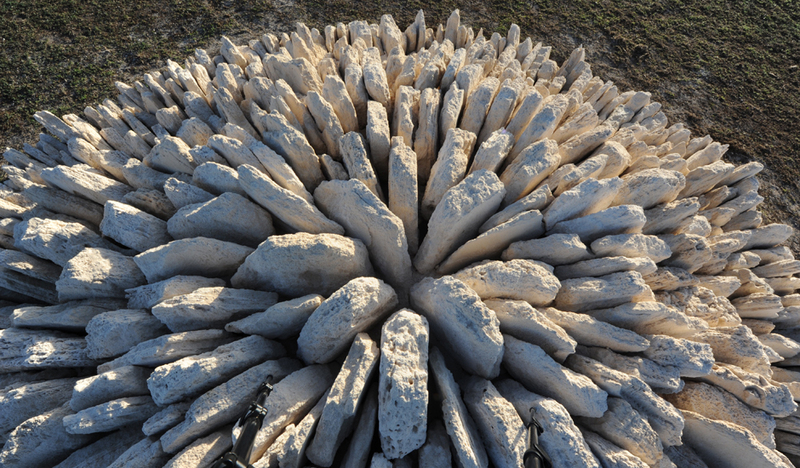 Using 19 tonne of local limestone shards and with the help of volunteers we created an ever decreasing spiral 7 metres in diameter and about 120 cm high. Beneath this spiral we stacked 12 cubic metres of reclaimed hardwood from dead trees in the nearby forest. After 100 or more years, the limestone shard, dome like form, will compact together as the wood rots, tightly locking the structure together, leaving the inside hollow. The wood having turned to earth by fungi, the greatest recycler, and other micro and macro organisms. As in many cultures, the belly button is the centre of new life, strength and fertility. Currently Elaine is working with Mitch, the daughter of Vivienne Brockman, to design an appropriate nature based art to honour and protect the life giving area – the sink hole. We see the woman in this farm project developing to reflect art and agriculture in a range of ways, in particular indigenous traditional practice in selecting and placing plants into the landscape. We hope that in redeveloping this field, including the sink hole, into a growing female form, could result in stabilisation of the land and cleaner water running downstream. That would represent a triumph of art and agriculture in our minds, the precious spring water source and female form being revegetated and protected.